This last week sped by and now today we are starting a new week and the calendar is already filled each day with some fun school activities. I survived the Pumpkin Ring Toss Friday evening so my husband claims we will get this grandson through High School. He was on the side lines cheering me on Friday evening. 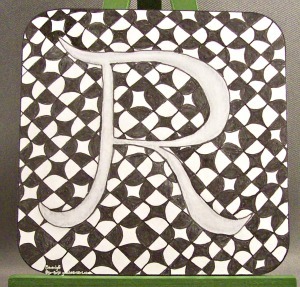 We're up to the Letter R. This is my tile. I decided to do a monotangle using the tangle Rio. This tangle is kind of an optical illusion. If you look straight on you can see some circle X's, if you kind of tilt your head to the side you can see squares and diamond shapes. I again used a silver PrismaColor pencil to do the shading so it's very subtle. Only I can see the tiny bit of shine. Tuesday it will be time to tangle and "S". Love what you did Beverly!